Step aboard this immaculate Carver 410 Sport Sedan cruiser and you’ll be immediately impressed by its spacious interior, terrific layout and feeling of being in a much larger motor yacht. Her large open salon, galley-up layout and raised dinette make entertaining a breeze and offers 360-degree views. This low-hour Sport Sedan offers an amazing blend of form and function and has been very well cared for. 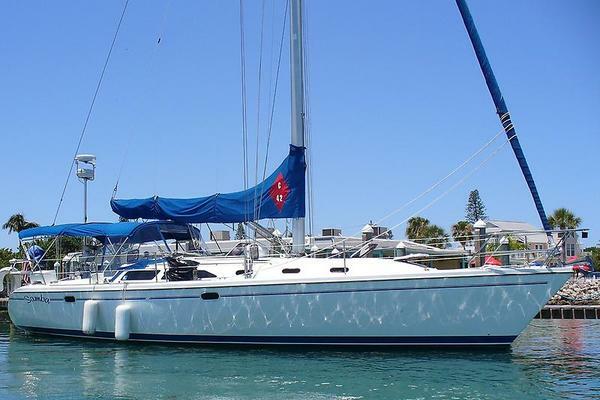 She also has a 10Kw Kohler genset to make anchoring comfortable while you cruise to your next destination. The large open salon has an ultraleather sofa and television. The large galley has a full size refrigerator, 3-burner electric stove, microwave/convection oven, coffee maker, stainless steel sink and wood floor. A curved stairway on the starboard side takes you below to 2 private staterooms with 2 private VacuFlush heads. The master stateroom is forward with a queen-size centerline bed, with private head with separate shower stall. The large guest stateroom is mid-ship with a private head. She has 3-zone air conditioning with heat and her interior woodwork is beautiful cherry. The massive flybridge seats 8 and has a wet bar and table. Plenty of storage throughout.